how to maintain a road? start with a span of mules. 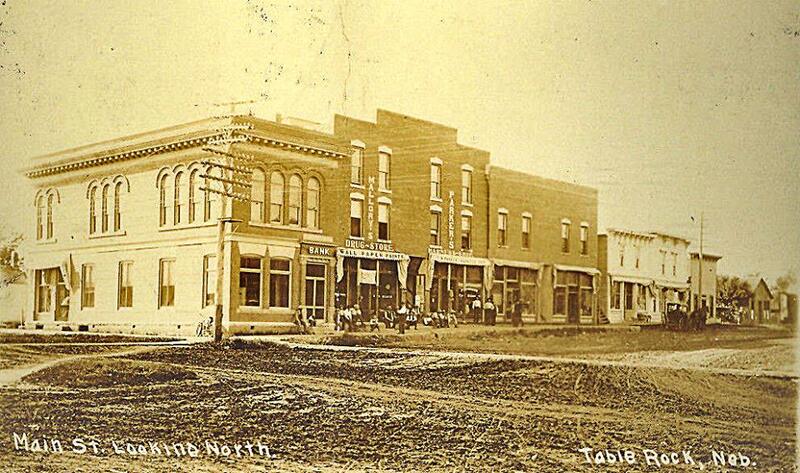 Thank you to Historical Society member Kim Vrtiska for finding this great picture as well as the one below. Note the board sidewalk, the dirt street. This is Luzerne Street, on the south side of the Square. 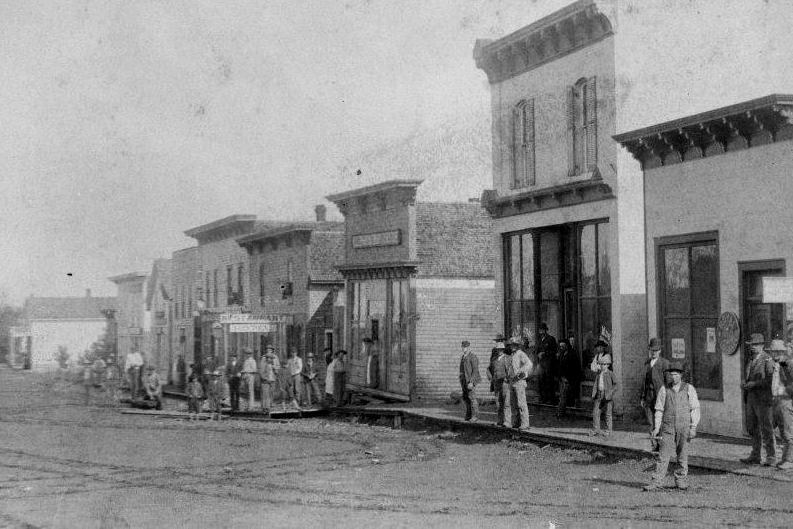 That frame building on the far right was replaced by the brick Argus building in 1894, but the store to its left is still there -- Sochor Electric was in it for MANY years. In 2016/2017, Harry Griebling Photography took over after the death of beloved charter Historical Society member Joe Sochor. The board walk may be gone but the street is still unpaved. The building now occupied by the Legion Hall is in place so this picture was taken after 1894. No clock on the bank corner, so the photo is prior to 1916. My grandfather, Rudolph Kubick, used to grade these streets with a horse drawn grader, part of his job as Town Marshal. For this purpose, he had to keep a team of horses, at their home. This amazing ordinance had some very unusual provisions!!!!! It was published in the October 20, 1890 Argus. It provided that it was to take effect "on and after approval and publication." The surviving Argus editions are spotty in that time period. Did the ordinance go into effect? Don't know. sECTION 1. ROAD TAX & 75% Of PERSONAL TAX TO BE PAID WITH.....LABOR! ​section 2. all who appear get paid $1.50 for 8 hours labor and $1.50 for each span of horses, mules, or oxen used. 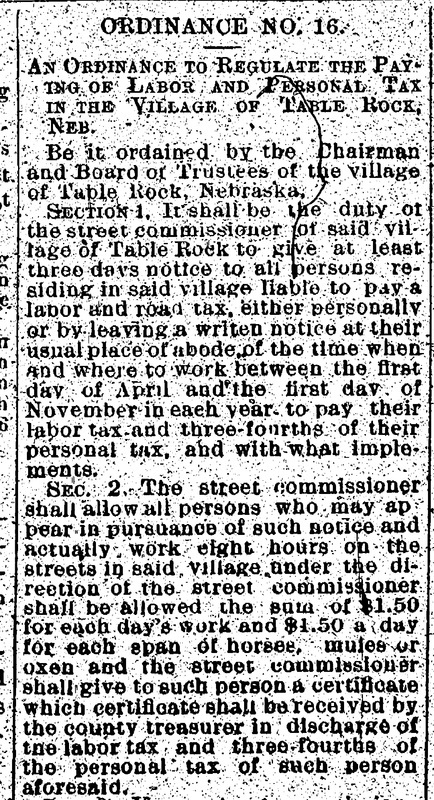 The street commissioner was given the duty to notify "all" persons "when and where to work" to pay their "labor tax" and 3/4 of their personal tax, "and with what implements." If they showed up and if they worked 8 hours, they got paid and they got their taxes discharged. 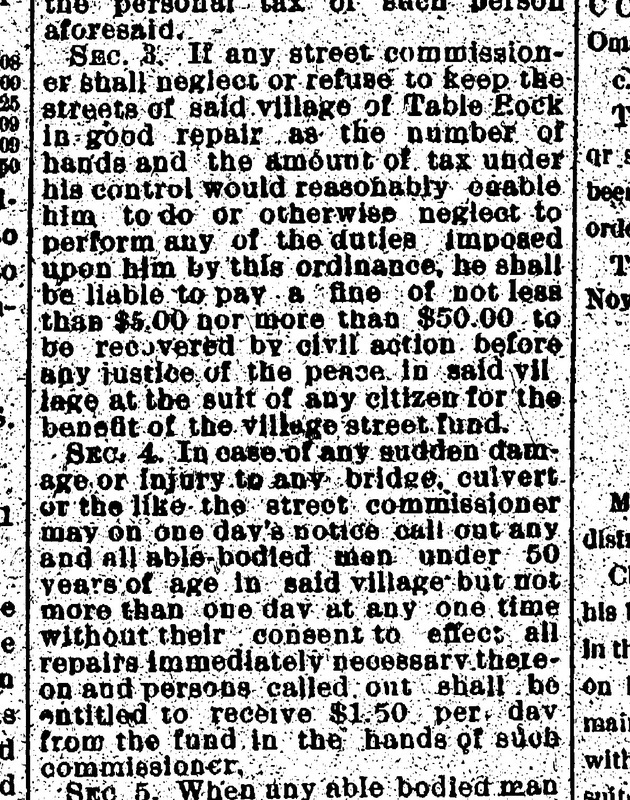 section 3: the street commissioner gets fined if he doesn't keep the streets up as expected! If we only had such laws today -- they might be implemented at a national level! From a clipping that looks back 75 years. Go toward the bottom & look at the description of Ordinance 35. 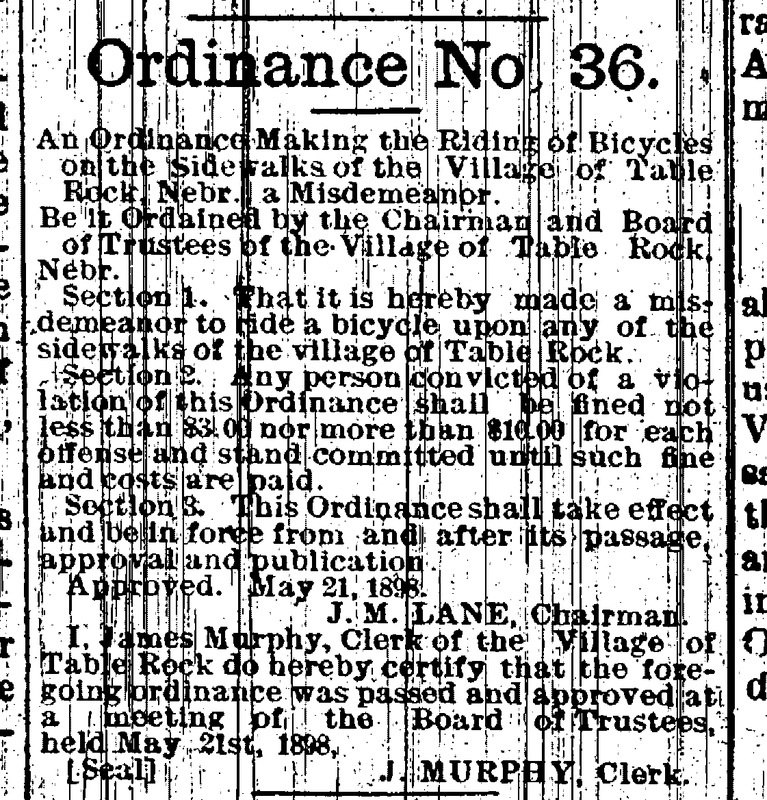 1898 - ordinance 36, no bicycles on the sidewalk! 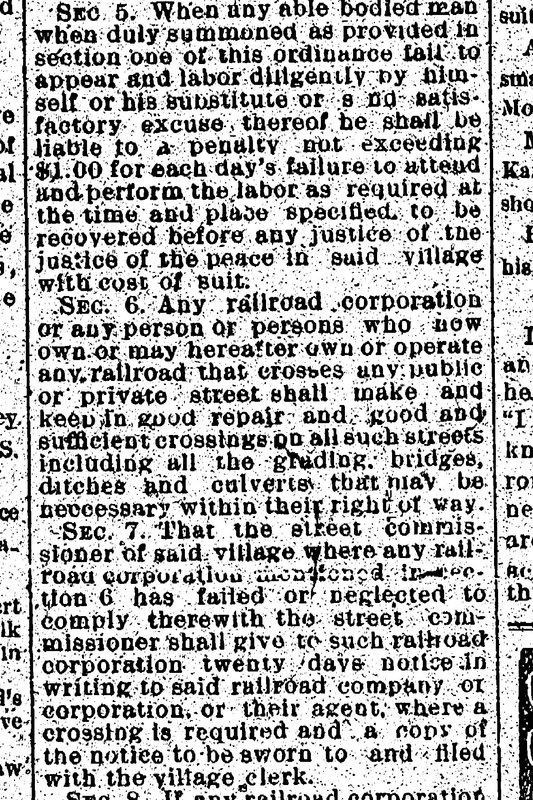 october 1898 - peter stevens refused to replace a sidewalk on the ground that it can be repaired and what happened. Forgot to write down which paper this was from, but it's too good not to share. 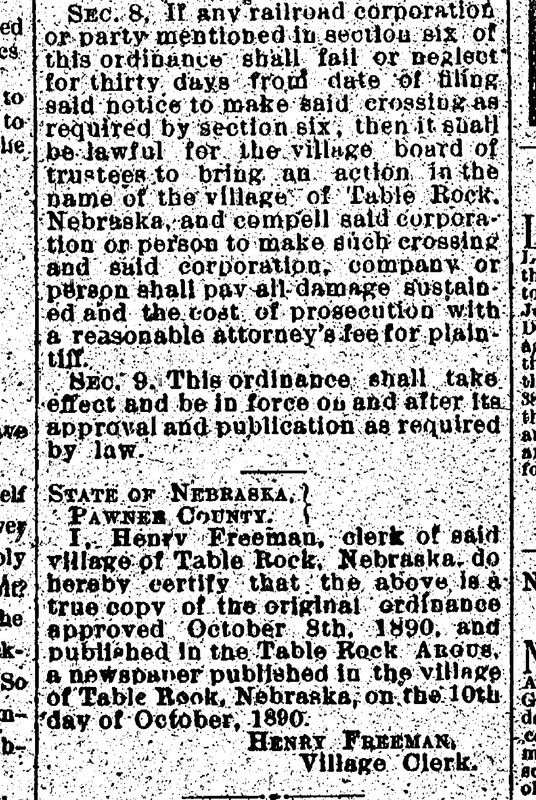 Earlier in 1898, Table Rock had passed an ordinance that any sidewalk that needed to be replaced had to be replaced with one of brick or comparable material. Wood sidewalks could not be replaced with wood sidewalks. Peter Stevens had a wood sidewalk that was apparently in front of a commercial lot. 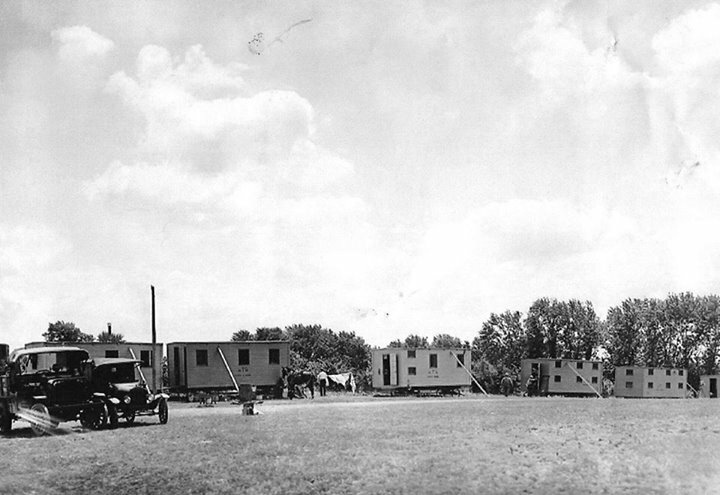 The lot was on the north end of the lot west of the building occupied by S. G. Wright's store. 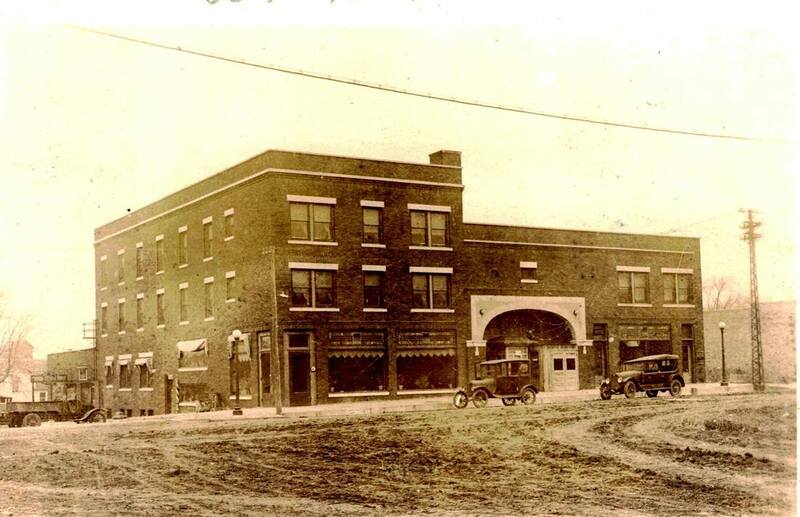 Where was S. G. Wright's store in 1898? Stevens was ordered to put in a brick one. He said heck no, it can be repaired. He headed for Pawnee City to get the lumber to repair it. Immediately, the street commissioner swung into action, and bystanders jumped in with enthusiasm as well! October 1912 - streets put in first class condition with a road grader and steam engine. 1921 - no bicycles allowed on the sidewalks!!!!! 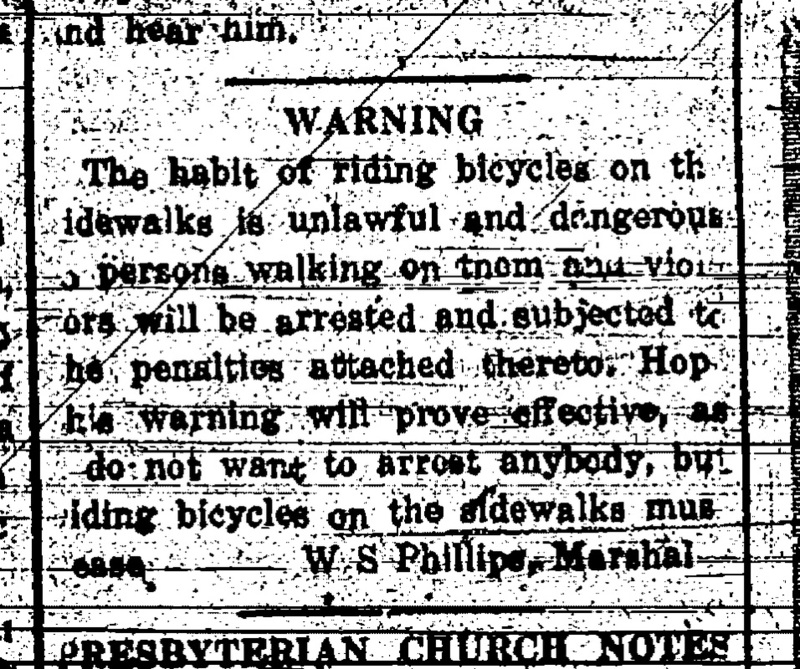 Marshal Phillips, "I don't want to arrest anyone, but riding bicycles on the sidewalks must cease!" My father, Ross Russell, was raised in Nemaha County (Nemaha and Peru). Hope you can find a place on your website for this. Below, Photo 2343, Photo by Arvid Blecha. Bing Crosby, Dorothy Lamour, Bob Hope. 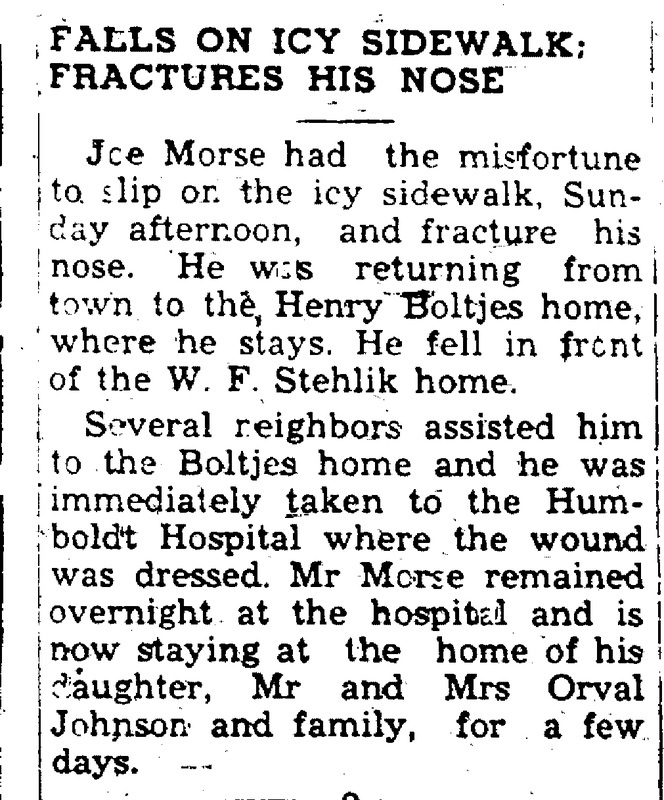 Joe Morse falls on the sidewalk in front of the W. F. Stehlik home, breaks his nose! 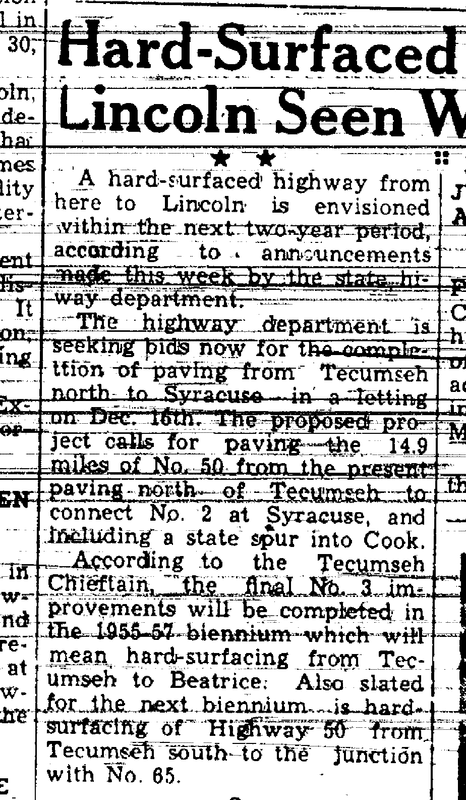 1954 - envisioning a hard-surfaced highway to lincoln. Oh my! November 25, 1954. Included will be surfacing from "Tecumseh south to the junction with No. 65." Table Rock, I presume. 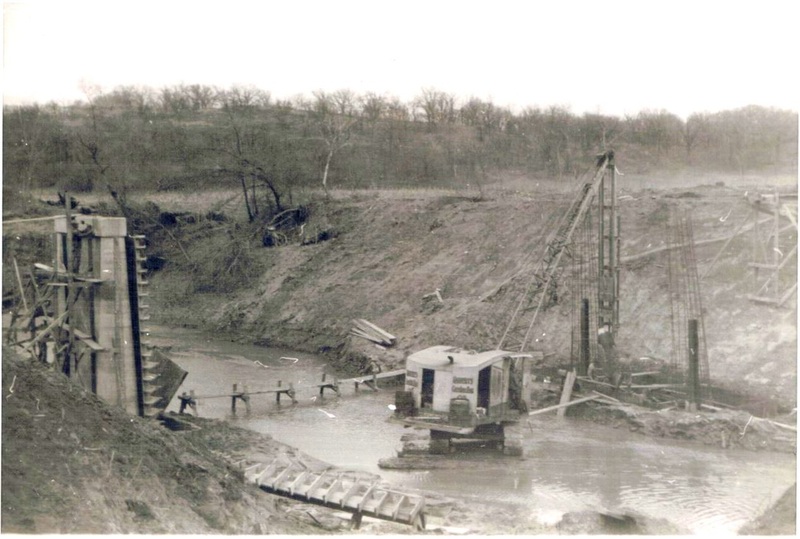 June 1957 - Streets to get gravel and rock! It should put them in good condition "again." Councilmen Layden and Mertes mentioned.